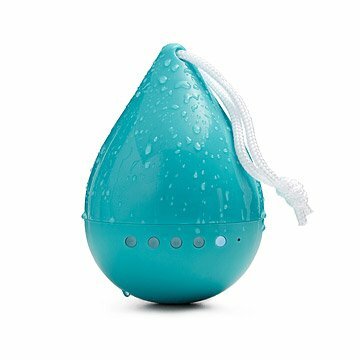 Turn up your favorite jams in the shower or at the pool without fear of splashing your phone with this cool blue droplet-shaped speaker. Water and sand-resistant, this clever device connects to your phone or mp3 player via wireless Bluetooth.® Easily adjust volume or tracks from the outer buttons. Made in China. 5.7" H x 4" Dia. My son loves the portable speaker, the blue tooth connection with the iPod was easy, the sound is strong and full. It is water proof and great to use in the bathroom. I was attracted to the look and (presumed) convenience of this product. Upon receipt, I discovered that you have to unscrew the top of the "drop" every time in order to switch the power on and off. This means removing it from the shower before and after each use in order to prevent the insides from getting wet when you toggle the switch. In addition, it had to be re-paired with my iPhone 6 EVERY time that I turned the power on. Minor complaint: it arrives very scratched on the bottom, as if it had been previously used. When I got the speaker, I could not get it to pair with my iPhone. I returned it (with extreme ease thanks to uncommon goods- painless process) the second one worked great. The sound quality is not awesome, but what you would expect from a small speaker. Nice that it's waterproof so it can go in the shower.